Two of Dufferin County’s top politicians found themselves in hot water this week after chiming in on the debate surrounding the future of a statue of Sir John A. Macdonald that until this week was in front of the Victoria, B.C., city hall. Dufferin-Caledon MPP Sylvia Jones noted that “history matters” during question period at Queen’s Park on Monday (Aug. 13), stating that the important role the country’s first prime minister played in Canadian history should continue to be acknowledged. Although Queen’s Park already has a large statue of Macdonald, Ms. Jones noted she’d be happy to see the Victoria statue put up somewhere in Ontario, a sentiment shared by Premier Doug Ford. 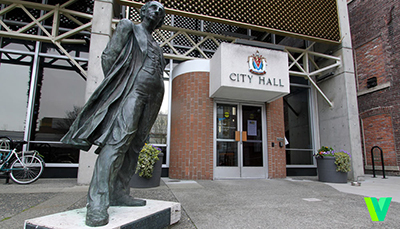 Victoria City Council voted to remove the statue from its city hall location and put into storage as a gesture of reconciliation for his role in establishing the residential school system in the late 1800s, which took more than 150,000 First Nation, Inuit and Métis children away from their communities and families. The move has sparked controversy across the nation, and Orangeville is no exception. The two founding members of the Dufferin County Cultural Resource Circle (DCCRC) took a stand during Monday night’s town council meeting to express how hurt they were by the mayor’s suggestion to bring the Macdonald statue to Orangeville. Most of council appeared to be dumbfounded with the revelation that Mayor Williams had indicated he’d be open to housing the statue in Orangeville, with Deputy Mayor Warren Maycock and Coun. Don Kidd noting this was the first they were hearing of the suggestion. Later in the meeting, Coun. Sylvia Bradley said she was “offended” by the mayor’s approach. Coun. Gail Campbell said she too was offended by the notion, saying she would hate to see a statue erected in Orangeville of an individual she believes “has done a great disservice to this country”. Mayor Williams acknowledged that, while this is a sensitive topic, he would not simply sweep it under the rug because a few people disagree. “I have my views and they aren’t anti-aboriginal,” Mayor Williams said. He noted he was upset when he learned the statue was to be taken down in Victoria. While the mayor states he has always been a supporter of aboriginal rights, he doesn’t think history should be ignored, choosing instead to learn from the mistakes of past generations. Gil Sipkema, himself a Sixties Scoop survivor, gave a passionate speech to council, vowing to fight any move to bring the Macdonald statue to Orangeville. “The statue went down for a reason. We will fight this to the very end. Residential schools are over. We shouldn’t be remembering the people who initiated them. We should be working on truth and reconciliation, not things like this,” Mr. Sipkema concluded.